Information Overload is an increasing problem both in the workplace, and in life in general. Information Overload is when you are trying to deal with more information than you are able to process to make sensible decisions. The result is either that you either delay making decisions, or that you make the wrong decisions. And let’s be honest, we all feel a kind of information overload because all of the sources of information we have today. If you are an Office Worker, you have to go get all the information from SharePoint, email, Yammer, and other systems you might have such as Zendesk, SalesForce, etc. harmon.ie Collage presents all the information workers need to do their jobs, in a single-screen. 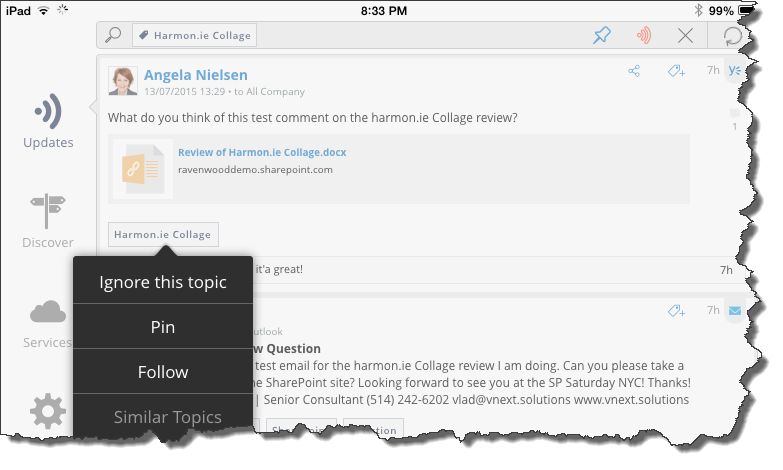 With Collage, workers have email, updates from business apps, documents, and social tools in one app. Collage is a launch pad for completing tasks via native apps or sharing updates by email or social tools. Collage automatically uncovers and then matches shared topics across all apps. Topics can be customer names, project titles, or products; essentially, any subject contained in app updates, discussions, documents, or email messages. 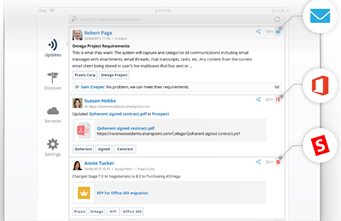 Workers can then focus on a specific topic by filtering Collage’s federated information stream. Harmon.ie gave me access to the application through their TestFlight beta program and I had the chance to play with it on my iPad mini. For now, Collage only works on iOs devices but will hopefully be available for Android as well as Windows 10 devices in the future. 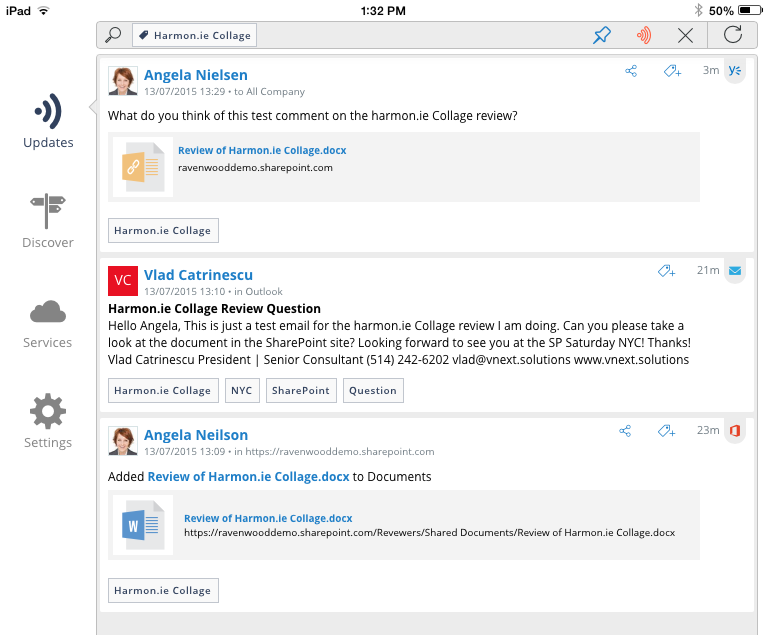 The first thing you have to do after getting the harmon.ie Collage app is to connect the Services. 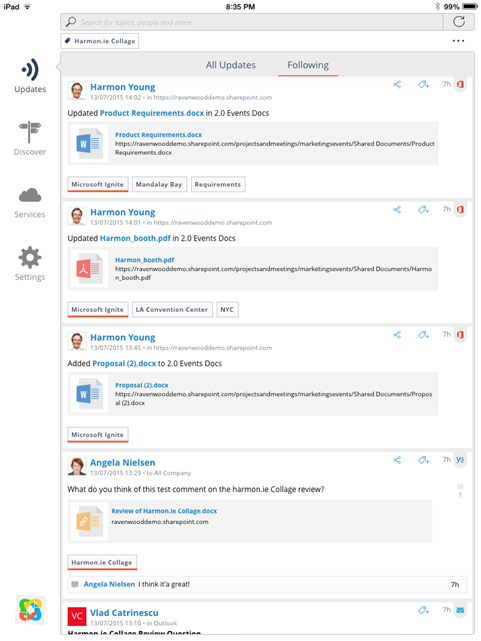 Harmon.ie currently connects to Office 365 (SharePoint sites and Email), Salesforce, Yammer as well as Zendesk. After you login in your services, you can view what profile you are logged under each service, as well as set preferences for each one. Once you connect them, you can configure the settings of every service to only get the information you care about. For example, you can set what document libraries or sites to follow in SharePoint as well as decide if you want to get Yammer updates from all company or only people you are following! Once you get everything setup, on the updates tab you will see updates and everything what happens in your organizations in one single view. You can view who it comes from, as well as what service it comes from. But, what’s the most important and the goal of this app is the tags of every item, called “topics” in the app. When you click on a topic, Collage will show you all the information from a certain topic from all your services. 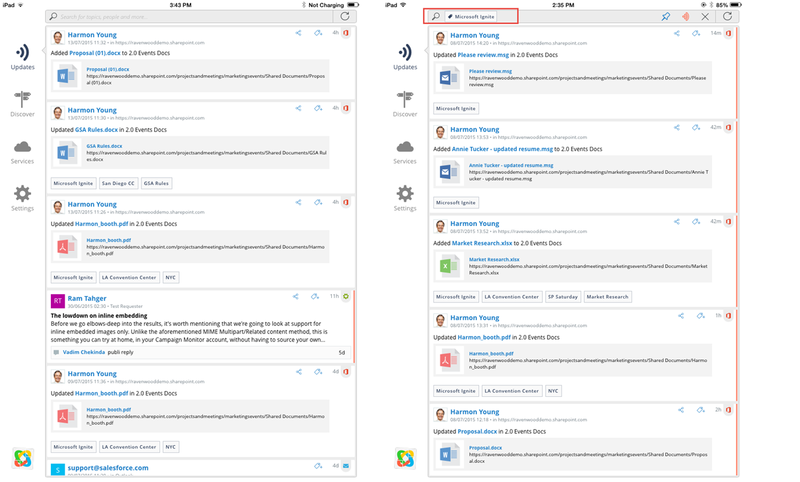 So, if you talk about a client in Yammer, upload a contract in SharePoint Online, exchange a few emails and change its Salesforce status, you would see them all in the same view. The good part is that the content gets automatically tagged! Collage uses machine learning to go through conversations and documents in order to find the topics of each item. Here is a screenshot of the pre-provided demo, but we will create some content and see if the tagging works properly a bit later in the review! Another very cool feature of the app is the “Discover” tab. 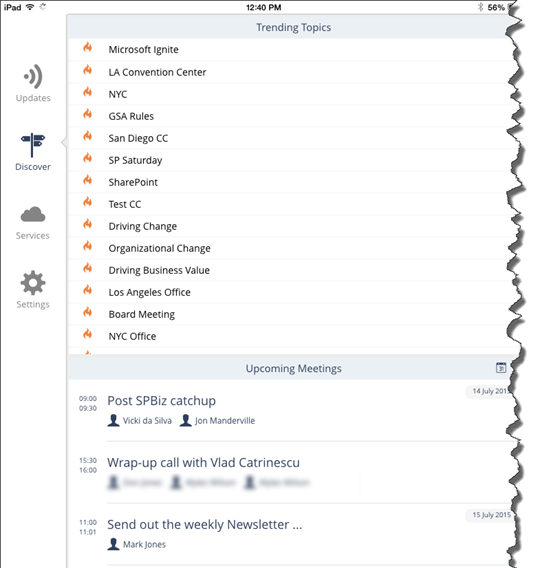 In the Discover tab you can see what topics are currently trending in your company as well as your Upcoming meetings. Whenever you click on a trending topic, you see all the interactions for that topic and for the meetings you see everyone that is involved as well as any topics that the meetings are about. Let’s start adding some information on those cloud services to see how the automatic topic recognition is working. I first sent an email to the test account about the harmon.ie Collage review and inserted some keywords. As you can see the keywords are NYC, SharePoint and Question. Since I also posted a document shortly after, Collage told me there are updates available for my news feed! Now, the document from SharePoint appeared in my newsfeed, and Collage picked up the “Harmon.ie Collage” topic and tagged both my two new items with that! When I sent a meeting invite using similar words, it was able to tag it automatically and show it as a topic. 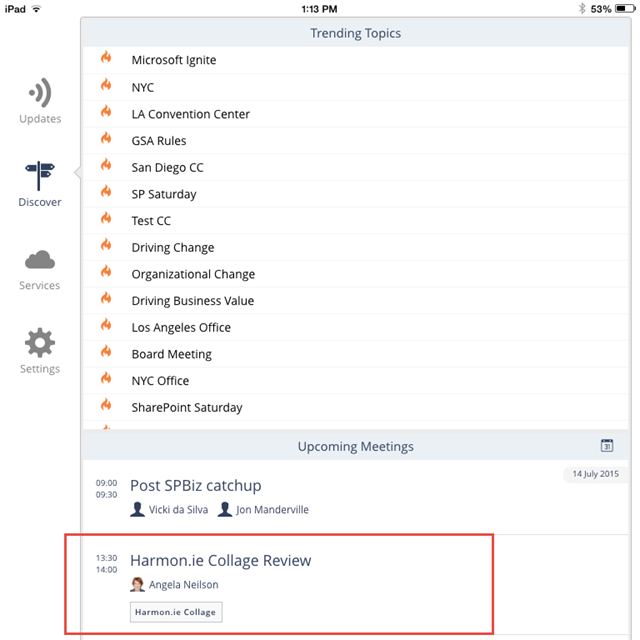 When you open up Collage in the morning, view your meetings for the day and click on the topic, you can see everything related to that topic so you get the information you need to make the right decision fast! 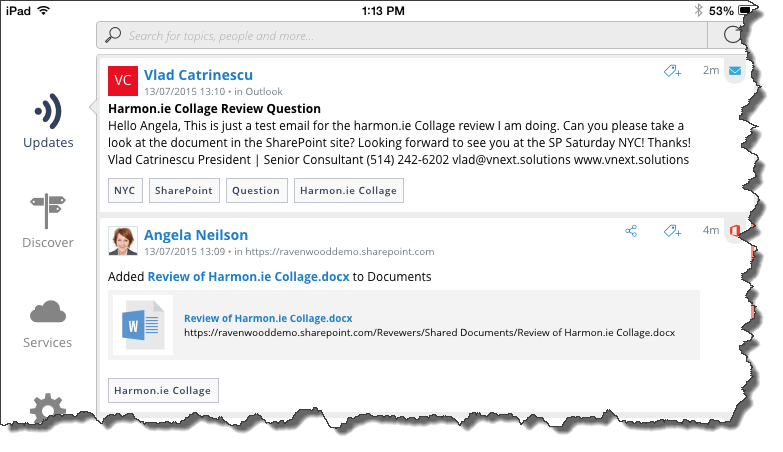 If I click on the Harmon.ie Collage topic in the picture above, I am able to see all the Yammer conversions, email, as well as SharePoint documents related to this topic! If you have some topics you are always interested to see news about, you can either Pin them or follow them. On the Updates home page, you have a special view with the topics you follow. Also all your pinned topics get pinned right under the Search bar for easy access. 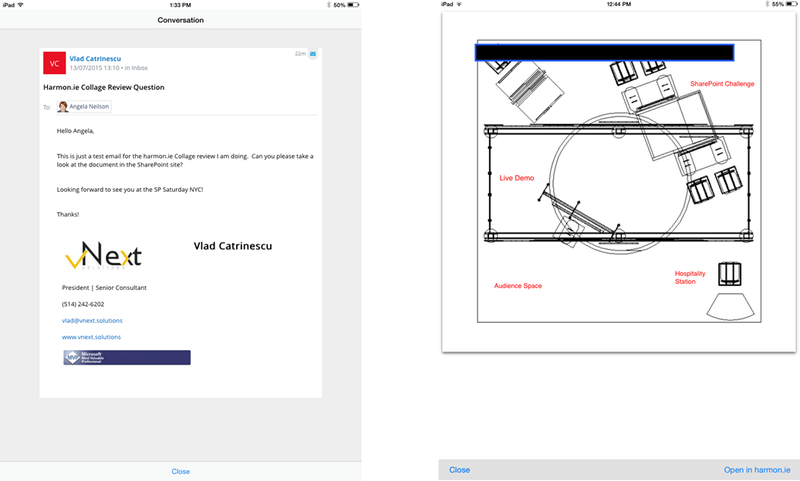 Lastly, you can open items such as PDF/Office documents as well as emails directly from the app to view them! During testing the app was great. What I realized is that Salesforce might log you off if inactive, so you will have to re-login to that service when opening the app after a few days of inactivity. Another thing to know is that this app is completely personalized to you, even its deployed company-wide. Meaning that, the taxonomy is created for every person individually, and for example you can create custom topics and add topics manually to items, but those will not be shared with everyone across the company, it’s really an app personalized for you to make you more productive! Information Overload is a problem that people are facing today in the corporate world, and a lot of money is being wasted because the good decisions cannot be made in a timely fashion. Harmon.ie aims to fix the information overload problem with Collage by creating THE app you open to get all your information on a certain topic. You have a meeting with a client called Contoso? Well you simply go to the Contoso topic and you can see the latest news and discussion around this client from only one app! Previously you had to open multiple programs and websites to get all this information. This app uses the latest technology possible such as Machine Learning to automatically tag items with the correct topics, so they can be easily found afterwards. A feature that I found missing, but will probably get included in the final version (Remember the version I reviewed is still beta!) is a way to “secure” the app with a code or something similar. This feature exists in the other harmon.ie apps, so I don’t worry too much about this being included in Collage as well! To Register for the beta or know more about the app, click the logo below! 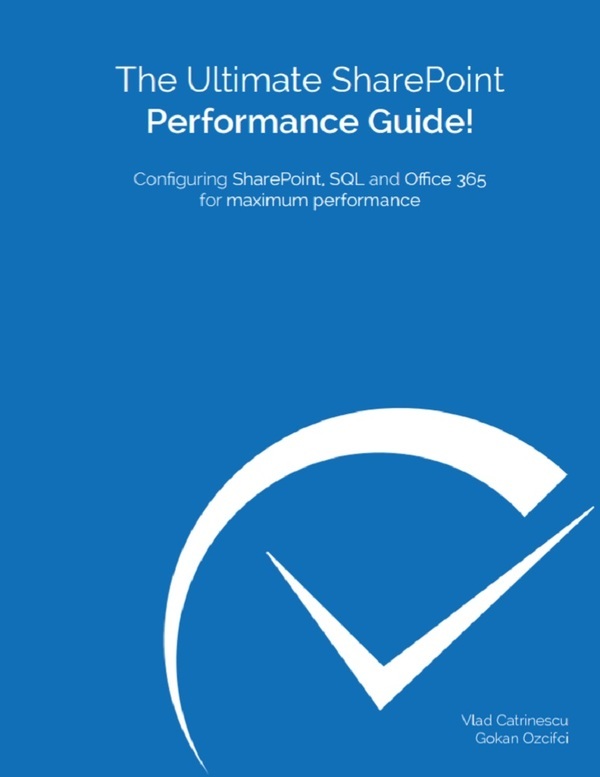 Harmon.ie just released a comprehensive Industry report on the Microsoft Office 365 Opportunities and Challenges for Microsofrt Partners. I am happy to have been one of the reviews of this report together with other MVP’s and Influencers such as Benjamin Niaulin, Todd Baginski and Patrick Hosch! I am excited to announce that I have just finished my first PluralSight course on Office Web Apps 2013! 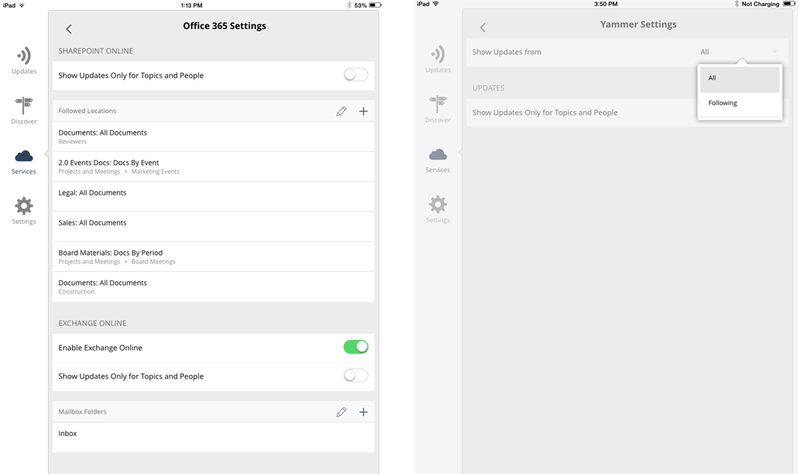 Office Web Apps Server is a new Office server product that delivers browser-based versions of Word, PowerPoint, Excel, and OneNote. In this course, you will learn what exactly Office Web Apps 2013 is, how it works and how you can install and connect it with Exchange, Lync, and SharePoint. This course is aimed at the SharePoint, Exchange, Lync or general SysAdmin who needs to install, configure and maintain Office Web Apps in their organization. However, the first module is for everyone, as it is only an introduction to Office Web Apps and the demo at the end showcases all the features Office Web Apps has to offer. Why did I choose Office Web Apps? I think it’s a technology that not enough companies implement, and the benefits it has vs the costs are amazing! Last year, I did a presentation at five SharePoint Saturdays about connecting Lync, Exchange, SharePoint and Office Web Apps together. The feedback I got is that no one really knew all the benefits that Office Web Apps added to SharePoint. 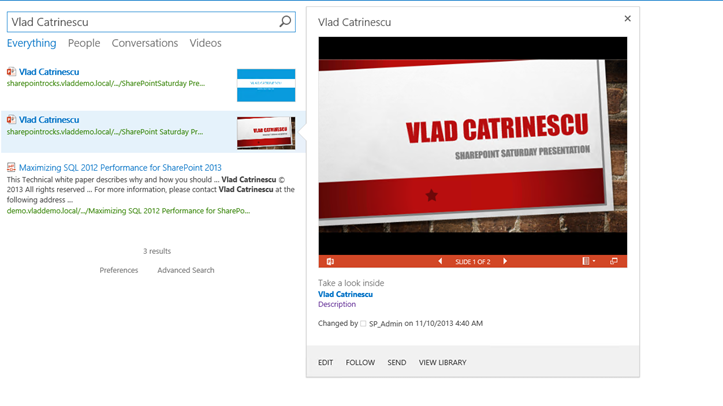 For example, the ability to preview documents and view complete Office documents directly in the SharePoint Search page! 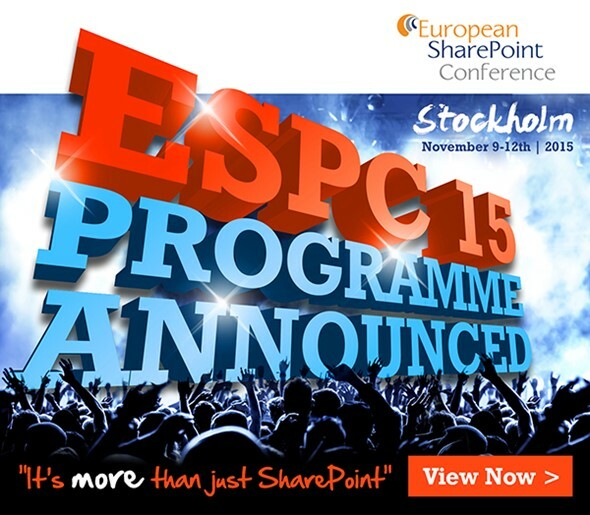 In case you missed it, the European SharePoint Conference 2015 programme is now available and I’m delighted to announce that I am speaking at Europe’s largest SharePoint and office 365 event in Stockholm Sweden from 9th-12th November 2015. I will be conducting a session on “Automating your SharePoint Deployments with TFS and Build Server” aimed at IT Professionals. 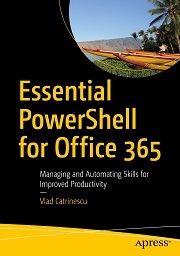 Have you ever wanted to get rid of the classic PowerShell deployments scripts every time you build a new SharePoint Solution? As a developer, don’t you wish you could just deploy the solution on a DEV / QA farm directly from your Visual Studio without having to wait for your SharePoint Administrator to deploy them for you since he doesn’t want developers to be local admins on the servers? As a SharePoint Admin, aren’t you tired of developers bugging you to deploy their solutions? In this session you will learn how to configure TFS Build Server to automate the SharePoint Package deployment to SharePoint servers and how to monitor your deployments! 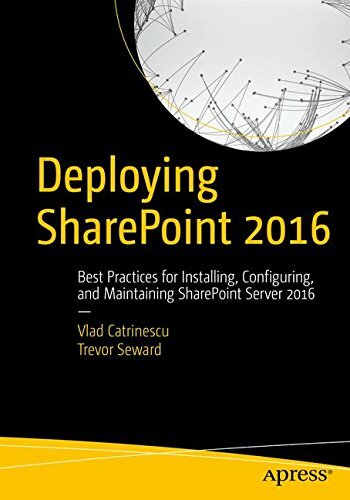 If you want a comprehensive breakdown of the latest innovations on all workloads of Office 365, and SharePoint is one of them, including the inside scoop on SharePoint 2016 and Office 365 Next Gen Portals as well as practical, actionable advice on how to leverage the cloud, SharePoint, Yammer, the Office Graph, Delve and much more to the best of your ability then European SharePoint Conference 2015 is a must in your calendar! Prices start as low as €1100! There is also special group discounts for bookings of 3 or more people. This year, I have the honor to speak at quite a few SharePoint Conferences around the globe. Most of the conferences, give speakers a unique discount code we can share with attendees so they save money on SharePoint conferences when they sign up. So here are the discount codes for the events that I will speak at this year! SharePoint Fest Seattle August 18-20 http://www.sharepointfest.com/Seattle. Use Code CATRINESCU to save 200$! I will post codes for other conferences as soon as I find out about them!